So this is Matt and Brian this morning in Ann Arbor at 9 a.m. Matt said they stopped about 30minutes outside of Ann Arbor last night and got a hotel, barely because most were all filled up with Ohio State fans, and they got to the exit at 6.30 this morning and waited in traffic, yes traffic, to get into the parking area. They pulled in their spot at 8 o'clock this morning to set up for tailgating. They are cooking a fine breakfast of coffee, steak and eggs. I haven't heard back from them since this picture was made because they were busy trying to get their breakfast in before they headed to the stadium. The game starts at noon on ABC, Billie and I will be watching for the men in bowl hats! Everyone have a great Saturday. GO BLUE! 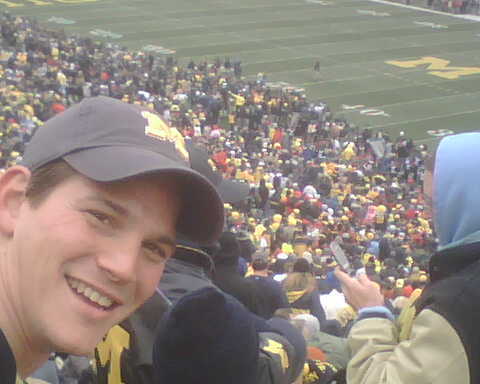 The BIGHOUSE 2007, Michigan against Ohio State. Matt, for those of you who do not know, is a HUGE Michigan fan. I got him tickets for that game for Christmas the year before, and we went together. 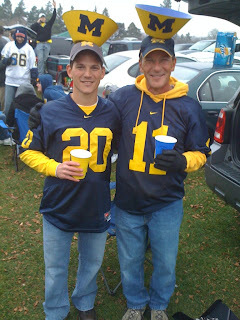 He had never been to the Bighouse before, and it was a fantastic time. Ohio State won that game, and it was cold and rainy, but we still had a blast. Flashforward to today--Matt and his dad leave today at 4pm to drive up to Michigan to see the Michigan-Ohio State game tomorrow at noon at THE BIGHOUSE! He is so excited! He has been packing since Monday--no joke. He also made bowl-bound hats for them to wear, I will post a pic later, sorry I forgot to take one. He took big bowls, painted them yellow, put a big "M" on them and we velcro'd them to his hat! If Michigan wins the game tomorrow they will be eligible to play in a bowl, so that is the reason for the bowls. Funny, huh? It is fun to see him so excited about the game, and I am so glad that he gets to go with his dad. They are going to have a blast. He even is planning to tailgate, at 7 am! He is making steak and eggs for them for breakfast. I know for sure they will be exhausted when they finally arrive home Sunday night. Pray for good weather and safe travels! I will update tomorrow! Sunday was the Buddy's Race against Cancer and we have a team every year in memory of Michael, we call it the Bassmaster's. This year I trained for it and ran it with Matt. How amazing that was! 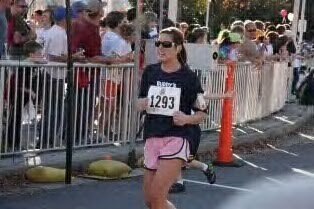 I ran with my wonderful husband for my first race ever, in memory of my other wonderful husband. God is good. He has blessed me with two amazing men to love. Matt probably could have won the race, he is very fast. But he stayed back with me at my snail's pace and we finished in 32 minutes. It was a hard race, I thought, with lots of steep, long hills! But I never stopped, I kept going to the finish. (I could be quoted as saying "Crap! Another Hill." as I was coming down one and heading up the last hill of the race, though.) I was so surprised when I got to the end and Angelique, Riley, Jennifer, Billie, and the rest of the bunch were all there cheering for us! It absolutely made me feel like the most special person at the race! I just assumed everyone would be out walking, but there they were as we came around the last corner. I was so surprised. Second time that day I cried. The first was at the very start of the race, when we had a moment of silence before we began to honor those with cancer and remember those lost to cancer. Matt held my hand and we bowed our heads and I said a prayer to God and also asked Michael to be with me and help me to finish. So I had both of them there with me at the same second, it felt like. And almost like he could read my thoughts, Matt squeezed my hand right as I was telling Michael thank you. I started the day out so nervous! Once we got started, I calmed down. I am fighting a chest cold/ sore throat illness, but I didn't let that stop me! I did take yesterday off, however. I plan to go for a run today, though. I think Matt and I might run another race in December. 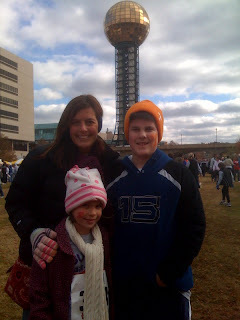 It's the Jingle Bell Run for Arthritis. We get to wear jingle bells! Not sure how that won't annoy me, but we will see! This race is in the morning, and I do so much better in the morning. The Buddy's race was at 3pm, the worst time of the day for me. Isn't that nap time? If only I had time to nap every day, that would be a perfect world! So, it was a wonderful day. I finished my first race. I ran with my loving husband for my other loving husband. Doesn't get much better than that. I still get down sometimes, but God is ever faithful to give me days like that as reminders that He is still with me, He has not forgotten me. One side note for prayers: Billie has a staph infection in her throat. She is really feeling terrible and is not showing any signs of recovering yet. Please pray the antibiotics will kick in and stop this nasty infection, soon! 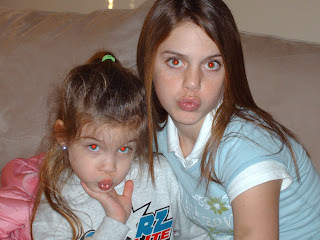 Billie and Courtney and the famous "Hollywood Face"
Billie played her heart out this weekend in Morristown. She just shined out on the field. She played full back and really stopped the other team. She was so aggressive and you could see with every play she made, her confidence just grew. By the third game, she was on fire. She did exactly what she was supposed to do, and she stopped them every time. They only won their last game, and placed 7th overall. I have no idea how many places there were, but she was just tickled that they won a game! They haven't had the best season, I think I mentioned it before. But she has learned so much this season. This was her first season as a U10 player, and she had to go up to a bigger field as well as learn off-sides and play with a goal-keeper. Her skills really have improved this season along with her confidence and level of aggressive playing. She may not be the quickest, but she has figured out how to wait for the other team to get to her, and then cut them off and apply pressure so she can get the ball. It is so wonderful to see, and so fun to watch her energy and enthusiasm. I am so proud of her. It was a very fun weekend, and i am sad it is over and we have to attack the week once again. I have a little case of the Monday blues, but I will work through it this morning and turn it into a wonderful week. Hope you all have a great week, too! Two blogs in one day--now that is a record for me! So these pictures are from the Buddy's Race Against Cancer last year. I know I have shared this with everyone, but for those who don't know I will explain. We always have a team in memory of Michael called the Bassmasters. 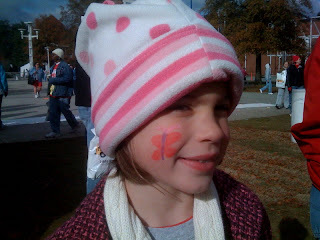 We go and spend the day at the World's Fair Park and walk and eat Buddy's BBQ and the kids get to play in the pump it up moonwalk things and get their faces painted. It is always such a really good time, and we get to remember Michael and honor his memory, too. I always end up getting a migraine by the end of the day, only because I put too much pressure on myself. It is to me the day where my two worlds collide, if that makes any sense at all. While I love it, it is a reminder to me of being left behind when Michael passed away, and it brings up the guilt that I have lingering somewhere deep inside me that I have moved on with my life without him. I had no intentions of ever getting married again. God had a much different plan for my life than I did. I am so glad he did, because I am so happy now and Billie and I have such a wonderful life with Matt, not to mention I wouldn't have my beautiful Joshua and Caleb! God is so good. Michael made it a point of telling me he wanted me to marry again; that it was OK with him if I married while Billie was still little. (He said "as long as it isn't like 6 months later. You have to miss me and be miserable without me for at least a year!" He was very funny, and he meant it to be funny not knowing that I would really be in a deep state of mourning for a year solid.) So I know it was OK, and God has blessed me with two wonderful husbands, but you never stop loving and when I feel that loss it always is with a twinge of guilt. I know Michael would not want me to feel that, and I don't usually feel that, but never the less it is there on occasion. So at the Buddy's Race it is always in the back of my mind, and it causes my head to hurt! This year will be a little different because Matt and I are RUNNING the race! I am so excited, and scared. It is my first race. I do not plan on winning, only finishing. I am still very slow, so there is no chance of me winning. But I have been running regularly 4 miles a day 5 days a week, on average, and I am ready for the race. I did slip on a leaf during my run yesterday and I pulled a muscle in my leg--but I know it will be OK by next Sunday for the race, it has to be. That would just be a cruel joke to get this close and a leaf be the end of it! I am going to baby it for the next couple days and pray for quick healing. Back to my explanation of the Buddy's Race Against Cancer; it is a local race and all the money goes locally to fight all kinds of cancer. They even have a special fund in Michael's name that they use to educate the rural areas on colon cancer prevention. All of my close friends and family come together, both sides of my family (Williams and Rosecrance) so it is truly very special, and I know Billie will one day look back and see how wonderfully awesome her family is and how totally supportive they all are to honoring the memory of her daddy. 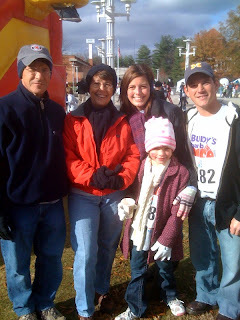 So the race is Sunday, November 15 and I have been thinking a lot about it so I thought my first "Flash Back" should be a few pics from past races and what it is to our family. Have a great weekend all! Billie had another project for school. The assignment was for a diorama of an ecosystem. 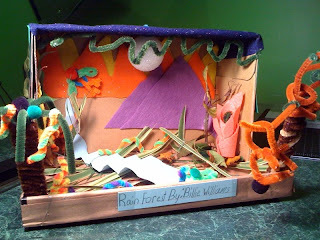 She chose a rain forest because she loves frogs and she knew she would be able to include frogs in it. She had to make all of the animals, and she chose to use pipe cleaners to make a Macaw, frog, lots of snakes, a monkey and a sloth. She used felt to cover the top like a night sky, and to make mountains in the back ground. She had the brilliant idea (I know, my kid so I am biased) of putting the river coming down from the mountains and making it smaller at the top and larger at the bottom so it would look like it was flowing. It turned out great, and I hope she gets a good grade. I think she will. She really enjoyed the whole process, too. She has started taking her multiplication tests, too. So far she has passed them all, through 2. It will get hard now, so cross your fingers for us. She is so smart, though, I know she will fly through them! It is a lot of work every night, though. She has spelling words to learn; she takes a test every Friday on 20 words. She has multiplication tests every Monday and Thursday, and she has to read for a minimum of 15 minutes every night. Luckily, soccer is almost over so we will start having more time in the evenings. Thanks to Grandma and Grandpa who really help her study every Tuesday and Thursday! Billie has a soccer tournament this weekend in Morristown. Last year didn't go too good, so I hope they are more successful this year. No matter, we have fun going and it is a nice end to the soccer season, regardless. I love the families of our soccer team, and it is so nice to spend time with them. Who knows where we will be next season, if our house sells we will be on the other side of town so this might be her last season with this team. That makes us all a little sad, of course, but I also know where one door closes, another one opens. It will be an exciting adventure to meet new friends! I have a BIG exam today in biochemistry. It is on metabolism, and it is all so detailed and easy for me to confuse. I will let you know how it goes. I am very scared for this one. I am doing very well in the class so far, so I really don't want to let my grade drop. I have studied so hard, though, so I should do fine. It always scares me to go into an exam without the confidence to back me up. I will take your prayers at 1:20 today that I don't have anxiety and I do my best! Can you believe these adorable pumpkins? I didn't find them, Chandler's mom, Kathleen, found them and gave them to us. I just love them. I wish there was some way I could save them forever. It is amazing. I am not sure if you can tell from the picture or not, but it really is two pumpkins, conjoined in the middle, and they share one stem. 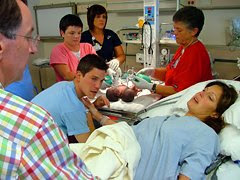 It makes me think of the boys, how they were conjoined in the middle and shared one umbilical cord. I used to ask all the time, "I know I have heard of two headed turtles, but do you think other animals and plants are conjoined, too?" And now I know they are! It was just a sweet thing that made me feel close to my boys. Maybe they don't call them conjoined, they probably call them "mutated" or something equally awful. I don't care what they call them. To me they are conjoined pumpkins and they made me remember my beautiful twins, that's all that matters to me. I decided if they were dressing up in heaven, which I know is a long shot, that they are probably the biblical Joshua and Caleb. Can you just see them, sweet little 1 year old toddlers in "Jesus Sandals" and toga-like clothes? Too cute, I thought. I realize I sound crazy, heaven is full of people worshipping Jesus and they do not have thoughts of earthly celebrations, especially a pagan holiday like Halloween, but it was fun to imagine. We had a great Halloween, and I will post pictures and blog about it later when I have more time. I have tons of school stuff over the next two weeks, but I will try to do short blogs like this one as I go so that I at least get something here. I am also planning on stealing my friend Vanessa's idea of "Flash back Fridays" and I just haven't gotten it together to start it. I thought by posting shorter blogs I maybe can get them on here more regularly. 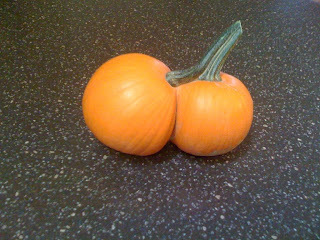 SO ...this was my random blog for today--conjoined pumpkins. Are you glad you checked it out?